Dr. Elisa Medhus never believed in life after death. As an accomplished physician, she place her faith in science. All of that changed after her son, Erik, took his own life. Then one day, he reached out from the other side. 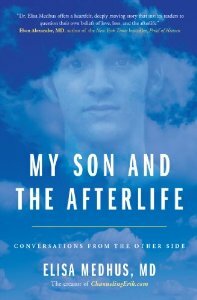 Intimate, heartbreaking, and illuminating, My Son and the Afterlife invites readers on an incredible journey from grief and skepticism, to healing and belief. Based on her wildly popular blog Channeling Erik, Medhus shares answers to the most universal questions of being human. At once tragic and uplifting, Erik speaks from the other side with candor, wisdom, and depth as he describes his own experiences and provides new answers on the nature of souls, death, and the afterlife - answers that have the potential to change our lives forever.